Our 2-day Alpine Preparation course will provide you with the tools and strategies to become an efficient Alpinist. Teaching you the skills you need to move quickly and safely over Alpine terrain. When climbing in the Alps, because the routes are so much longer, the time of exposure needs to be reduced. There are lots of ways that can help make the transition easier. For example, go lighter, climb in mountaineering boots, efficient rope management, using natural belays, moving together, and carried minimal gear. All of which we will look at on this course. We will teach you the ropework needed to be able to move together, and setting up quick and easy belays. All of this helps with making you quicker and efficient as an Alpinist. The alpine preparation course is 2 days long, and is run in North Wales. Our client-to-instructor ratio does not exceed 2:1, so that we can give you our fullest attention. All of our courses are tailored to suit your availability and experience, taking into account any individual needs and fitness levels. We will discuss any specific kit requirements with you when you make a booking. You need to have experience in lead trad climbing, the grade you climb is irrelevant. If in doubt about whether the course is suitable for you, please don’t hesitate to contact us. Each day of our alpine preparation course we would look at weather, and ability, and how this would affect venue selection, route planning, and off course descent routes. Here we would introduce climbing low grade climbing routes in mountaineering boots. 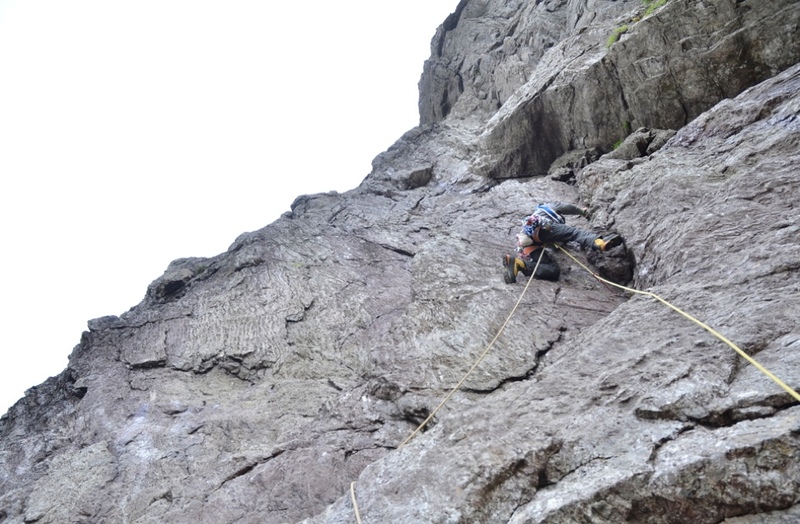 We will also look at simplified belays and anchors, taking alpine coils and when to use them, as well as abseiling. We will talk about the importance of minimal weight, without compromising safety. Here we will also put all of the previous day’s skills into practice and have a go at moving together. Please do not be worried. We will never ask you to do something you are uncomfortable with. The course content and location tend to be dictated to us by the weather, so the alpine preparation course layout can change. If you are unsure whether the alpine preparation course is suitable for you, please do not hesitate to contact us oninfo@riseandsummit.co.ukor call us on 07775 853 348, and we would be happy to help. ready to book this course?